brown. Old tradition: rub crosses on them. New tradition, use leaves to decorate. I am like my grandmother in a lot of ways. I am stubborn. I’m a fighter…and a survivor. I am a woman of faith. But I am also like her physically too. I have her coloring, and the older I get, the more I see her looking back at me in the mirror. And this morning, when I looked down at my dye-stained hands, I saw her hands. And I flashed back to my childhood. Standing in my grandmother’s kitchen with the light streaming in the window. Seeing the colored eggs lined up on the yellow and black tile. And watching her rub crosses on the newly-dyed Easter eggs. My hands today look just like hers did then. Starting to show age, not afraid of getting dirty, or working hard. Nails short. And dyed a little brown at the fingertips from dying eggs. As a little girl, Easter was always an exciting time. 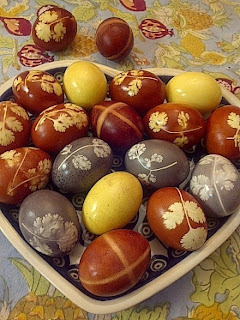 Usually on the Thursday evening, after going to church for the Vodnaluvah/foot washing, we would come home to dye our Easter eggs. We had all those cool colors – the tablets that you drop in the warm water with a spoonful of vinegar, the little copper metal scoopy thing that looked like a bent paperclip, the white crayon for writing people’s names. And every year, my little brother would always try to make a half and half egg and accidentally drop his still wet dark green egg into the beautiful yellow mixing the colors. That would get me so mad! By the end of the evening we had a mess on our table. But it was a lot of fun. We were blessed to have my grandmother live right on the corner of our street. She was over everyday, and she would bring over her carton of eggs, her special eggs, that she had dyed with onion skins. They were all one color – a warm dark brick color with crosses rubbed on them. This was the traditional Armenian way of coloring eggs. No gimmicks. Just basic. Simple, natural dye using what our people had. They were survivors. Nothing went to waste. The skins of the onions were used to color the eggs. I know now, that this simple gesture, of coloring the eggs this way, was her way of tying her back to her roots, her childhood. A life that was uprooted by the genocide. A childhood that came to an end all too soon when our people were forced from our homeland and made to walk through the desert. She was a survivor. Although she never said it, I'm sure dying the eggs this way was an affirmation of her past...and her present. Once I got married and left my family home, I started dying the eggs with onion skins. It was a way to carry on the tradition. And when I had children, yes, I would still buy the Easter egg kits with the pretty colors, but I would always, always, do a couple dozen with the onion skins. By then, my grandmother had passed away, and I was determined to keep that tradition to keep her memory alive. And so my children grew up with this beautiful Easter tradition passed down from my grandmother. You all know about my empty nest. Last October, my daughter Ani got married, and this was my first year in 25 years that I have dyed eggs without her. Oh, she was still there…we were tweeting and texting back and forth through the process. We've always enjoyed dying eggs together. And we started a spin on the tradition a few years back…still dying with the onion skins but pressing leaves on the surface of the eggs to create designs or experimenting with other natural dyes too. My husband came into the kitchen to ask if I needed help. I didn’t have to answer. He picked up an egg and worked beside me wrapping the leaves for the dye. And as we worked, I started thinking about traditions and blessings and the past and the future. Wednesday, they got to work and created tray after tray of choreg. Baking Choreg on Choregshapti. Ani's are just like Mamajan's...and my niece's choregs were like my wonky shapes from when I was their age. As a parent, I am so blessed to see this full circle. Young and old…the past and present. Coming together. Traditions upheld, and new ones made. They bond us with our past, and create in us a sense of belonging, but they also help to bring familiarity to new experiences. And in a most beautiful way, they fill our hearts with the memories of dear ones whose presence is missed during these family holidays. Wishing you and your family a very pomegranate Easter – filled with traditions, fresh choreg, dyed eggs and abundant with God’s blessings! Krisdos haryav e merelotz. Ortnyal eh harootiunun Krisdosi! You can hear an audio version of this post read on today's podcast episode of "The Next Step with Father Vazken"
Those natural dyes are beautiful! I love how you weave stories from your past and your heritage into your daily life. Thank you for sharing. Thanks Bruce. And uh, you're the only one that's suggested that! Ariel, Thanks so much for coming back. I appreciate the comments. Happy Easter to you both!! !